Technology has driven global prosperity for centuries. Unfortunately, it has brought severe side effects. Some of today’s most pressing challenges have been partially caused by technology advances. CO2 emissions. The invention of the steam engine in the 18th century laid the ground for today’s fuel-powered motors and generators. These are causing man-made CO2 emissions, which are the likely cause of global warming. Water pollution. Numerous chemicals invented in the 19th and 20th centuries are responsible for the rise in water pollution levels. Poor mental health. With suicide rates at record levels and younger generations increasingly unhappy with life, recent studies indicate that the use of smartphones and similar devices is largely to blame for deteriorating mental health. Over the last four decades, the world has witnessed an interesting new trend. Technologies have been invented and employed solely to make the world a better place. Entire industries have developed around clean energy such as wind and solar. In 2013, wind energy in the US avoided the use of an estimated 95.6 million tons of CO2 - the equivalent of 16.9 million cars on the road - estimates The American Wind Energy Association. Nowadays, entire organizations exist aiming to make the world a better place. American car manufacturer Tesla’s main mission is "to accelerate the world’s transition to sustainable energy". Its founder Elon Musk emphasises that CO2 reduction is a key goal. He has built a loyal workforce excited to join his mission. Although other firms may be less bold in embracing sustainability, it has become common practice to create a Chief Sustainability Officer role, or to audit suppliers based on sustainability guidelines. In September 2015, the UN General Assembly’s 194 countries adopted the 2030 Sustainable Development Agenda. 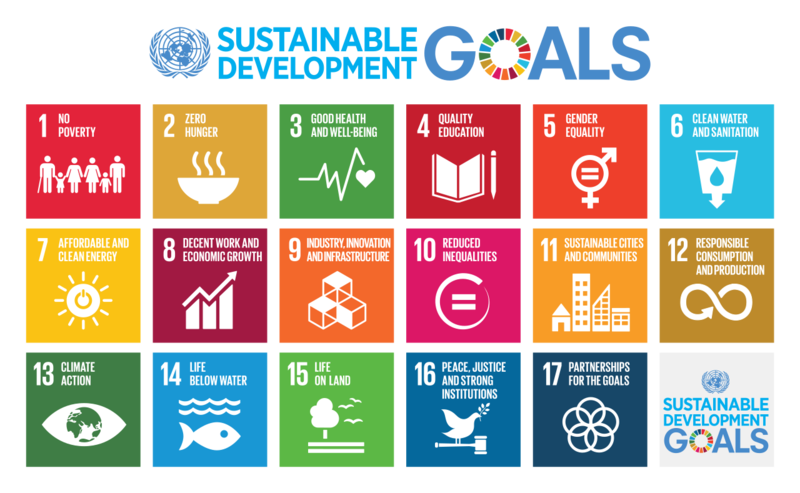 It includes 17 sustainable development goals, which member countries can use to measure progress. In this context, the vision of the World Economic Forum’s Digital Economy and Society System Initiative is ensuring our digital future is inclusive, trustworthy and sustainable too. The Internet of Things (IoT) is a key focus. 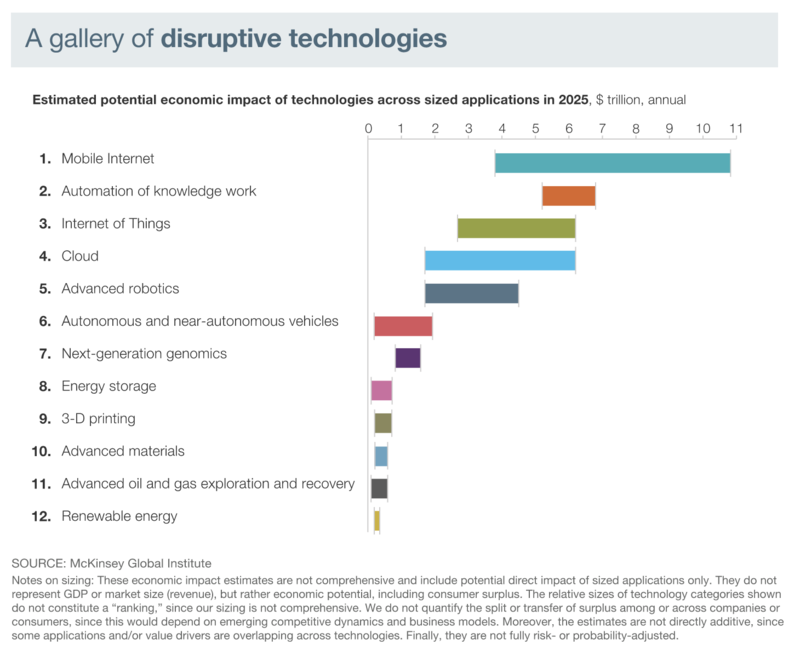 It is one of the three most impactful technological advancements we will see before 2030, according to McKinsey. By 2025, the IoT's economic impact will be around $11.1 trillion - 14% of today's global GDP - the firm projects. Looking beyond the IoT's economic impact, the Forum is researching its effect on society and on the UN's sustainable development goals (SDGs). Here are two results from this research, followed by an example case. Most current IoT projects can contribute to achieving both the SDGs and the UN’s 2030 mission. An analysis of more than 640 IoT deployments, conducted in collaboration with IoT research firm IoT Analytics, showed that 84% of existing IoT deployments can address the SDGs. Why is the impact of IoT so large? At its core, IoT is about measuring and remotely controlling previously unconnected “things”. It reaches people and objects that older technology could not. Examples include a remote water-monitoring solution that ensures clean water in regions with an indigenous population, and smart lighting initiatives in Chinese cities that halve total power output. Of the analysed IoT deployments, 95% are small or medium scale. Only a very small portion are large or macro-sized. Why are most projects so small? The IoT market is still in its infancy. The reasons why projects haven’t yet scaled to a large size - defined as affecting at least one million people, involving several industries and being rolled out across a continent - are various. On the technical front, interoperability challenges with equipment slow down scalability, as do different IT back-ends. On the commercial front, the budgets for sustainable IoT implementations are currently extremely limited, because they mostly come from company funds related to "innovation and digital projects". It will be some time before mainstream business P&L budgets - which are substantially larger - can convert these small implementations into large-scale deployments. The Smart Green Infrastructure Monitoring project in Chicago helps reduce urban flooding and prevents property damage, using better informed capital planning for infrastructure investments. It was developed by City Digital in Chicago. Capitalizing on the opportunities: Where to go from here? IoT projects which main priority is to address sustainable development challenges are crucial, but an even greater impact could be achieved by prioritizing sustainability goals within commercially driven projects. A significant number of the executives we interviewed leading these projects don’t necessarily see a direct link between their projects and sustainable development goals. However, 84% of IoT deployments - 70% of which were driven by the private sector - are addressing the SDGs, the research showed. Additionally, 75% of these concentrate on the five goals that correspond to some of the most profitable industry applications. This suggests that these projects' significant impact on sustainability is almost unintended, or at least not their main driver. Embracing a sustainability awareness culture is essential. Not only to maximize sustainability impact, but to build on commercial opportunities. Of the projects analysed, 95% are small or medium in scale. A significant number of them are successful, at least in the five areas of highest concentration within some of the most commercially viable industries. This presents an opportunity to scale up some of these projects to a large or macro size. Identifying sustainability goals and adopting an impact measurement framework will reveal opportunities for replicating successful solutions across untapped areas. 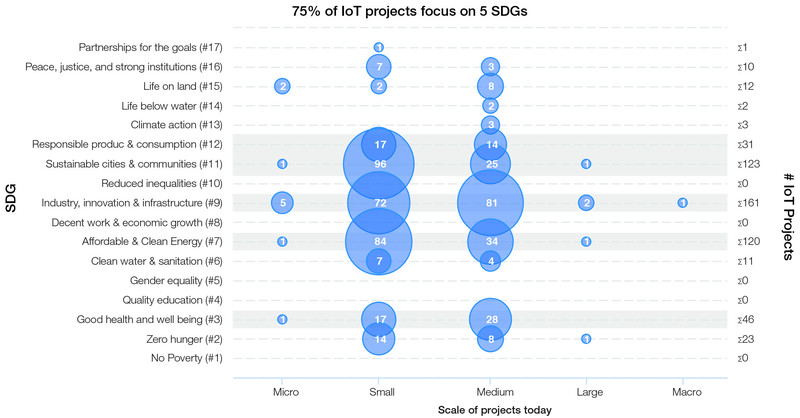 There are fewer IoT deployments focusing on SDGs like SDG 2 “zero hunger”, SDG 4 “education”, SDG 15 “life on land” or SDG14 “life below water”, according to the research. Some successful IoT deployments which focus on the top five SDGs could be replicated to deliver social impact in areas with fewer concentration of IoT solutions. This would generate new business opportunities. We need to foster a new mentality in IoT stakeholders, and particularly within the private sector, which prioritizes sustainability goals as part of commercial project design. Sustainability is not only the prerogative of CSR departments. It is an essential pillar of business, investment and cooperation. It maximizes social impact while still delivering - and potentially increasing - commercial value. Additional information: For more information on the IoT sustainability initiative, please visit the interactive research page. Building on the research results. To accelerate the adoption of sustainable IoT, the Forum has published a set of IoT Guidelines for Sustainability that will be discussed at the World Economic Forum Annual Meeting 2018 in Davos, 23-26 January. [KLL4] . These address some of the most pressing issues today, including collaboration models, infrastructure investments and innovative business models.